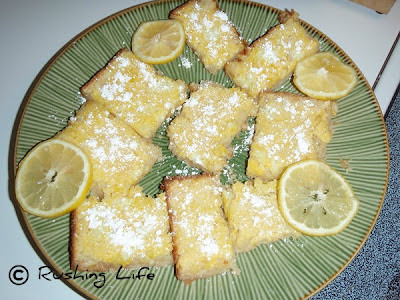 Way back in June 2008, lemon bars changed my life. It was my third date with Puff. I was smitten from the get-go. Our initial conversations and emails prior to even meeting were flirtatious and fun. Not to mention interesting. Our first date was fairly routine, but it must've worked because I sat for what seemed like hours on a park bench with him well after dinner and gelato had wrapped. Our second "date" involved him coming to my apartment to move my television so someone could buy my entertainment center off Craigslist. His co-workers were insistent that I was just using him. In my defense, I did buy him Wendy's for dinner as a thank you. Then our third date happened. That third date took us out into the country for me to experience my first ever flea market. We laughed at all the ridiculous things, flirted it up, and maybe even held hands for a few brief seconds. Once we got back to his place, we commenced making lemon bars. He knew lemon desserts were my weakness, so he had scoured the InterGoogle looking for a recipe and had all the ingredients on hand. Neither of us are worth much in the kitchen, especially then, but it was definitely memorable. I distinctly remember leaning over his sink and asking him if he cared if I went out on dates with other guys. He told me he preferred if I didn't. And just like that, we became Gail and Puff. No further discussion. No in depth DTR (determine the relationship). Just a passing comment and an intense connection that we knew was real and true. And here we are, almost 4 years later, celebrating our 4th Valentine's Day together. There aren't any grand dinner plans at a swanky restaurant or any card making festivities. But I love him now infinitely more than I did on that June afternoon all those years ago. And next year on this day? We'll have a squishy, cuddly 8 month old to dote on. And it will be the best Valentine's Day ever.